Historical ruins, beautiful beaches, sleepy fishing villages and world class marinas make gulet cruising in Turkey an experience no other country in the world can replicate. Cruising the Turkish Riviera is not a new phenomenon, but it never appealed to mainstream holiday markets until the last decade when the Internet shifted people’s perception of travel. Pre 2000, holidaymakers relied on travel agents to plan itineraries; but they now embark on independent forms of travel including gulet cruises around Turkey’s stunning coastlines. Gulet cruises also called Blue Voyage routes began 70 years ago. The exiled “fisherman of Halicarnassus” Cevat Sakir Kabaagacli, arrived in Bodrum in 1925 to explore the Aegean Sea and surrounding coastline destinations. He invited friends to join him, and they spent their time sponge diving, fishing, and wandering the Turkish Riviera. As a talented group of authors, word soon spread about their lazy days and explorations. We wonder if he knew his lazy days would later become a popular aspect of holidaying in Turkey. From a three-day mini Blue Cruise to a two-week itinerary, experts with years of experience and passion for showing off the Aegean and Mediterranean coasts plan the adventure. A gulet boat is a Turkish wooden sailing vessel. As masters in building gulet boats, Turks used them as fishing vessels, but when tourists requested accommodation overnight so they could stay on board, they adapted the design and these days, they feature all modern cons of a luxury vessel. Resorts like Bozburun on the Marmaris peninsula and many Bodrum peninsula villages have established strong reputations for boat building expertise and experience. A gulet boat varies in size and carries from eight to twenty passengers, each with private sleeping cabins. Everyone gathers on deck in the communal area for breakfast, lunch, and dinner if they choose not to dock into seaside resorts to visit restaurants. Most equipped boats have scuba diving, fishing equipment and designated sunbathing areas if the holiday plan is to soak up Mediterranean sun rays. Traditional boats are the perfect sailing vessels, but in recent years, modifications turned vessels into motorised yachts. Either way, it is a thrilling experience. The Turquoise coast stretches from the northern Aegean to the eastern Mediterranean. Winding its way from West to South, it comprises over fifty small bays and villages and many ancient ruins that add a twist to cruising the Aegean and the Mediterranean Sea. Passengers put together itineraries depending on historical sites or Turkish coastal resorts they want to see. They also follow established Blue Voyage routes. Out of all the coastal hubs, four emerged as major destinations. Bodrum: As the heart of where it all began, Bodrum’s reputation stems worldwide as an expert in gulet cruises, private yachts charters, and sailing holidays. 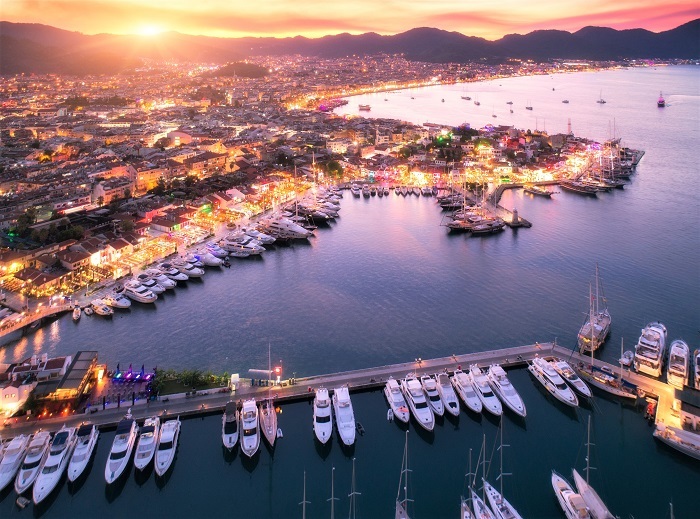 The peninsula comprises a major town centre and smaller coastal resorts that do luxury in style, as often seen in substantial mega yachts docked into bays. Out of all the seaside resorts, Yalikavak has shot to yachting fame because of its mega yacht marina. 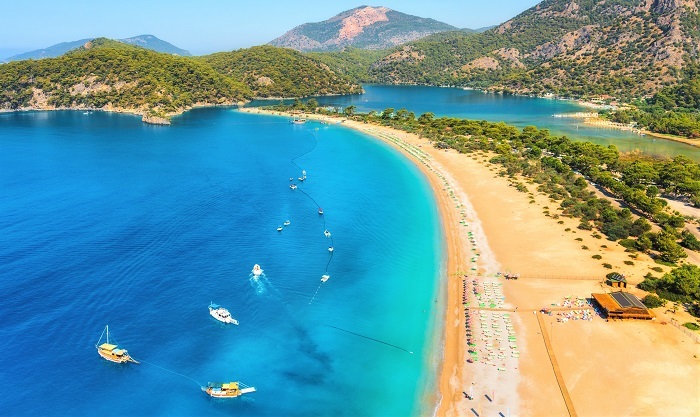 Fethiye: While Bodrum does luxury in style, Lycian Fethiye attracts budget holidaymakers with low cost, three-night trips to Olympos, further east along the coastline. 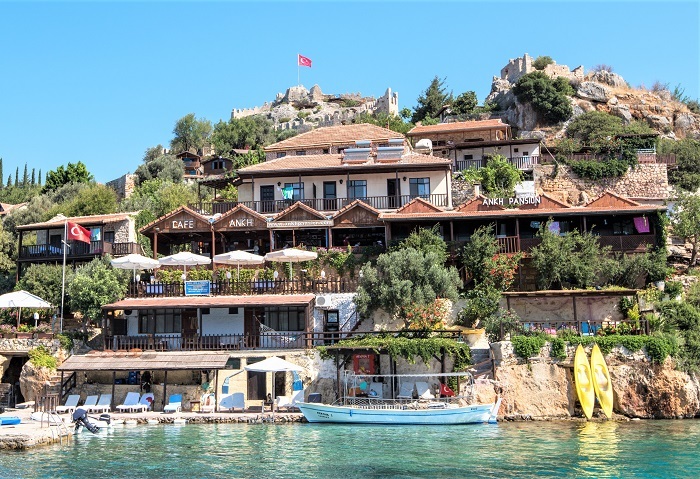 This blue voyage route takes in many delights like Fethiye’s twelve islands, Oludeniz and the Blue Lagoon, the prestigious resort of Kalkan, and Kekova sunken ruins. Marmaris: As a pioneer of Turkey’s tourism industry, international sailors have always favoured Marmaris. During summer, cruises depart from the harbour area to cruise around the coastline to visit hidden coves, off the track islands, and beautiful beaches. Antalya: The eastern Mediterranean is home to Antalya, the second most popular holiday destination. Antalya’s reputation for top-notch hospitality also wins it rave reviews from the yachting world. Even just sailing the Antalya coastline delights everyone as excursions to attractions like Mount Tahtali, Aspendos and Chimaera’s burning flames make every day different. 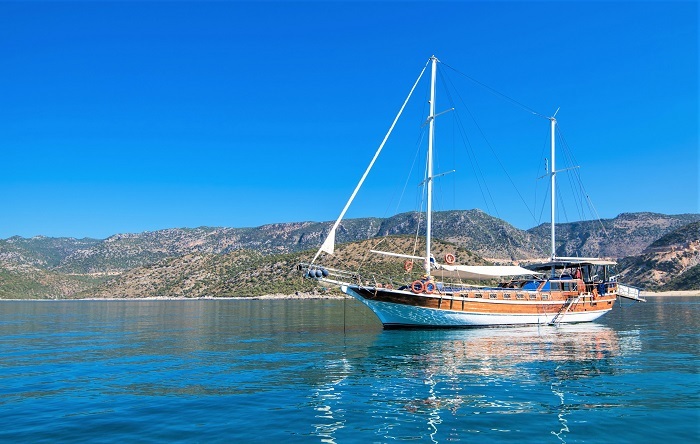 Gulet holidays are the epitome of rest, relaxation, and fun under the sun. Turkey’s various coastal resorts and mass range of historical landmarks are core themes, and most cruises are all-inclusive or half board, so all you must do is remember your swimsuit and sun cream. But holidaymakers take it one step further by theming their cruise. Yoga cruises have received much fame over the last five years, and we understand the popularity. Nothing rejuvenates the sense more than the sea, while sun provides copious amounts of vitamin D. Combine that with a healthy fresh diet and morning and afternoon yoga sessions on deck, you’ll return from your cruise as a new person. A lot of round-the-world backpackers enjoy single cruises on party boats, while couples often choose luxury cruises on small boats. Three other alternative themes are private yacht rentals, where you and the captain craft your itinerary. 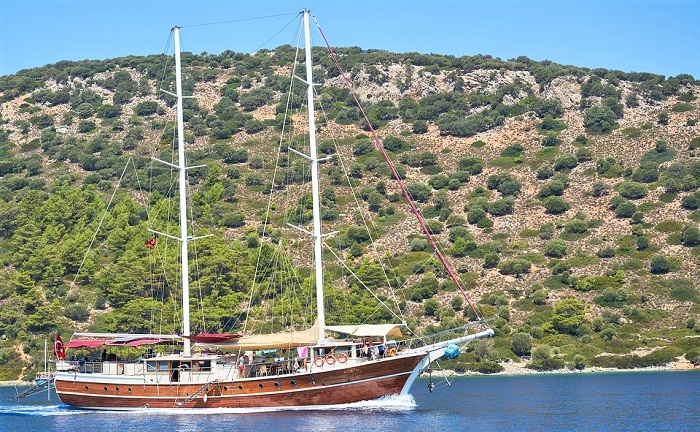 Cruise and stay gulet holidays are the perfect way to combine sailing with around the country land tours, and island hopping between Turkey and Dodecanese or Cyclades Greek islands combines two cultures with one. Whether you sleep in your cabin or on deck, under the stars, wake up to a delicious breakfast. The Captain then starts sailing to the next destination, to dock anchor and serve lunch on board, or if the yacht docks into a coastal resort, passengers enjoy free time to explore and eat in many restaurants. Depending on where you are, they run excursions to archaeological sites or you can take advantage of water sports like jet skis, swimming and snorkelling and para-gliding. See a sample itinerary of gulet cruising in Turkey, or contact us to receive more information via email on what you need to know when sailing Turkey.